When I worked as a technical specialist at Apple, no feature generated more questions and concerns than the cloud. For many, the cloud is a place where their data disappears to and somehow magically comes back when they want it. The reality is that the cloud is meant as an alternative to on-site data storage or system management. The cloud is a network of internet servers that store information. Some of these servers are meant to store data and others are meant to host an application or deliver some sort of service. These servers are owned by large data companies such as Google, Microsoft, or Amazon, that rent them out to customers. The cloud is great if you are a new or small nonprofit that doesn’t have the space or the manpower to maintain multiple servers on your own. If your nonprofit already manages its own servers, the cloud can still provide a cheaper alternative for data storage, email servers, and accounting systems. Cloud capabilities are already offered with many types of nonprofit software and cloud computing is considered the new normal for software. Whether your nonprofit organization is small or large, just starting out or well established, cloud computing is something you should consider. 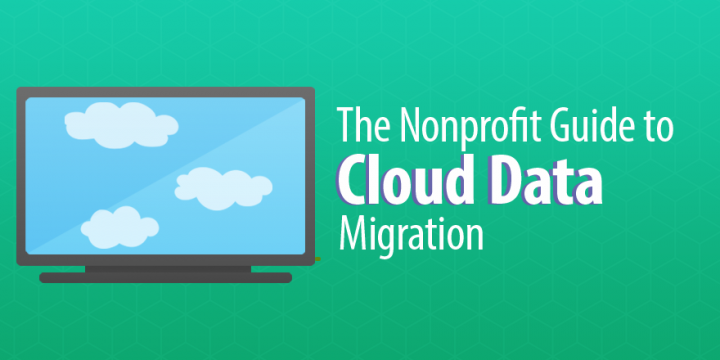 If you’re ready to take action, I’ve put together a comprehensive guide on moving your nonprofit organization over to the cloud. Should your nonprofit move to the cloud? Moving to the cloud has its benefits, but it’s not right for every organization. There are differences in security, control, and system reliability when comparing cloud services with on-site data and system hosting. Before you jump in to the cloud, you should analyze the benefits and drawbacks to cloud computing. Scalability: Cloud hosting services already have the hosting capabilities available when you sign up with them. As your nonprofit data demands grow, the host provides more space to you. While these storage upgrades will cost you money, this will be peanuts compared to the costs of on-site hosting, which includes initial hardware purchases, upkeep, staff to manage your servers, and additional hardware purchases when you outgrow your system. Security: Cloud hosting services know what it takes to keep your information safe. Nonprofits don’t always have the funds to keep IT security experts on staff, but cloud hosts do and they are far more equipped to protect your data, according to Web Hosting Sun. Limited downtime: If you maintain your own servers and they go down, there isn’t a backup to rely on to keep operations running smoothly. However, major cloud hosting services have backups upon backups as well as dedicated teams ready to manage server disruptions. This minimizes system downtime, resulting in higher productivity for your nonprofit. Cost: On-site hosting has a high cost of entry as well as higher ongoing costs due to maintenance and staffing needs. The initial cost of purchasing equipment and setup costs range from $5,500 to over $8,000, server replacement every three to five years, warranty costs as high as $2,000, regular maintenance running as high as $400 a month, and finally the backup cost of $1/GB per month. In contrast, many cloud-based services such as G Suite are free for nonprofits. As for cloud hosting, the average monthly cost is $28 per month. Far cheaper than on-site hosting. Lack of control: Handing over your data to another service obviously means that you will relinquish control of the protocols taken to store and secure it. Be sure to review the host company’s safety measures and make sure that you will still own your data even if you decide to pull out of this service. Speed: According to Contegix, local hosting is faster than uploading and downloading to and from the cloud. This makes sense as your own servers are dedicated to your nonprofit organization only, whereas cloud hosts deal with your data as well as everyone else’s. Splinters in systems: You may find that not everything your nonprofit does will fit into the cloud hosting model. This could lead to less integration between different functions at your nonprofit, such as donor data and email marketing services. If the benefits are not in your corner, it’s probably best to stick with your on-site system until barriers to entry, such as speed or lack of integration, are resolved. However, if the pros outweigh the cons for moving your nonprofit to the cloud, great. It’s time to find out what you can migrate over. Which systems can you move to the cloud? Using a cloud-based productivity suite such as G Suite for Nonprofits (which offers their services to eligible organizations for free) gives you the flexibility of accessing your word processing documents, spreadsheets, and presentations from anywhere with an internet connection. Store important documents, images, and spreadsheets in an internet accessible cloud space provider, such as Google Drive, IDrive, or Dropbox. Centralize your email system through a cloud provider such as Gmail, which works in conjunction with the entire G Suite. Cloud calendars, such as the one provided by G Suite, allow for easier collaboration and communication around schedules. This will probably be one of your biggest cloud migrations and the most beneficial to your organization. Hosting your donor database in the cloud gives you the ability to access that data anywhere with an internet connection, easy scalability when your database grows, and easy integration with other cloud-based services such as email marketing or development software. Bloomerang states that accounting is not moving to the cloud as quickly as other functions—collaboration is one of the strong pros of cloud computing, but many accounting teams are very small or even just one person. However, as your nonprofit grows, the manpower needed to handle accounting will also grow, making cloud computing a smart option for accounting at that point. You now know the benefits of cloud computing and the possible applications of the technology in the nonprofit world, so it’s time to decide which cloud hosting services you will use and which systems will remain on-site (if any). To do this, you should conduct a cost and needs analysis of all of your local systems, which will help you determine what you’re willing to pay for each cloud service you’re considering. Compiling the costs you spend on on-site hosting and your needs will help you select your cloud provider(s) as well as negotiate tailors to their services to match the features offered by your on-site system. You want to either match or exceed the capabilities offered by your local system when moving to the cloud. Once you’ve picked which functions you plan to move to the cloud, the individual capabilities of these systems, and the price you’re willing to pay for them, it’s time to choose a cloud provider (or providers). See Cloud Spectator’s list of the best cloud service providers for 2017. When choosing a cloud provider, it is important to go over all aspects of its services, costs, features, and especially its security precautions. In fact, security ought to be one of your biggest concerns when selecting a cloud provider for storing sensitive donor and employee information such as bank account information and credit/debit card numbers, driver’s license or state I.D. numbers, and social security numbers. Make sure you comb through the privacy policies and terms of service with a lawyer and IT expert. You want to maintain complete ownership and privacy of any data stored on the hosting servers. If your nonprofit organization doesn’t maintain full ownership of data or your data is accessible by the hosting company’s employees, that company is not fit for your nonprofit. Nonprofits deal with lots of sensitive data on a regular basis and any data storage that breaches that privacy runs the risk of violating any number of nonprofit data regulations. For more information on nonprofit data privacy and liability, be sure to read Nonprofit Risk Management Center’s guide on the topic. When migrating your data and functions over to the cloud, it’s best to seek the guidance or hands-on help of the provider or an IT expert so you don’t lose any data in the process. Some providers will offer their own backup services at a cost as well. Migrating over to the cloud isn’t as simple as pushing a button and watching all of your nonprofit systems become one with the new cloud host. It requires planning and contingencies in case something goes wrong. 1. Back up your data: Whether you choose to back up your data yourself or hire a third-party backup service is up to you, but in the interest of caution, I would recommend going with the third-party service, especially if you don’t have the IT know-how on staff. For more information on third-party backup services, read Top Ten Reviews’ list for the best online backup services. 2. Plan your migration: Once you’ve backed up all of your data, it’s time to choose the “how” and “when” of your data migration. Make sure your migration date allows for minimal disruptions (such as over an extended holiday) and set deadlines for the migration to finish. Also, discuss with your provider the priority order of migration for data and applications, in case there are functions that your nonprofit will need access to sooner rather than later. 3. Test out the cloud environment: After all of the details are fleshed out, work with your provider to set up the cloud environment. Your setup should include testing connections, features, and integrations so that once your data has moved over, your team can begin using their cloud-based applications without a hitch. 4. Begin the migration: It is a lengthy process and will most likely require tweaking on your end as well as the provider’s to ensure the data fits and functions in the new cloud environment. 5. Work out the kinks: It goes without saying that additional testing is required after the migration is complete to smooth out any bumps in functionality or to identify any data lost in the process. If so, use your backups to fill in the data gaps. Congratulations! You’ve now successfully moved your nonprofit organization into the cloud.